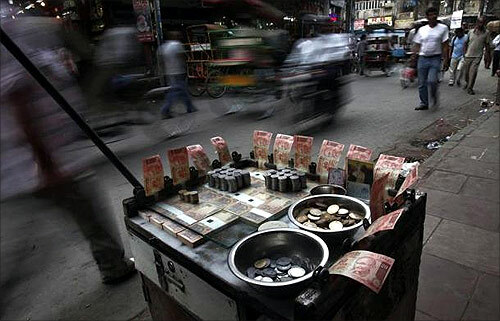 Rediff.com » Business » Is India losing its way? Is India losing its way? Is India losing its way? That was the question that The Economist magazine posed to Shashi Tharoor and me to debate. After two rounds of sparring, this is how I concluded. For every cheery statistic that Tharoor invokes, there are at least as many gloomy ones to be counter-invoked. For every irresistible force of optimism that insightful observers such as Pratap Mehta see in the churn that is India today, there is an immovable object of doubt and despondency. No wonder Joan Robinson famously said: "Whatever you can rightly say about India, the opposite is also true." So, instead of rehearsing the arguments, I want to make some claims about the state versus market debate in India, offer some observations on Indian politics and propose a way of judging the winner of this debate. Tharoor and many others correctly identify that the state is a problem in India, but advance the dangerously misguided solution that the state should get out of the way for India's vibrant private sector. In some areas, the private sector can indeed fill in for a weak state. If, for example, Indian public sector institutions cannot provide the skills for the IT and outsourcing industry, a company like Infosys can create a large training institute to remedy the gap. But there are limits to this process. India's growth cannot be sustained without a revitalised state that performs more limited functions, but performs them well and much better than it currently does. Will this be easy? In some areas, technology can be harnessed to improve state capability, as in the case of Nandan Nilekani's Unique Identification Authority initiative that can be a game-changer in helping the state achieve its necessary redistributive role, but efficiently. But consider others. In the power sector, greater private sector investment will only be possible if the underlying public sector governance problems - that people will pay for power and that politicians will not divert it - are solved. In the education sector, outcomes will improve only if actions can be taken against the teachers - often powerfully connected in local politics - who do not show up in schools. More broadly, private sector investment needs security of property rights and sanctity of contracts, which in turn requires the courts to function. And, physical security will never be legitimate, and rural health services never profitable, for the private sector to provide. The problem is that there is a deep, and under-recognised, asymmetry between state and markets. It is easier to create markets than it is to create state capacity or to prevent its deterioration. Creating markets is a lot about letting go, establishing a reasonable policy framework and allowing the natural hustling instinct to take over. Building state capacity and improving governance, on the other hand, are quite different. They involve overcoming collective-action problems, mediating conflict, creating accountability mechanisms where outputs are multiple and fuzzy and links between inputs and outputs murky, and contending with the deep imprints of history. In Weber's memorable words, building a state or public institutions is like the "slow boring of hard boards". If this assessment is right, India's economic task seems challenging. On democratic politics, the bright spot in India is the emerging development that delivering good governance and economic growth is being politically rewarded and is hence, increasingly seen as good politics, especially in the states. This development could have enormously positive consequences, but it is still nascent and uneven because of Indian politics' dark underbelly: rampant and unchecked corruption, coalition and dynastic politics that favour the status quo and stymies change, the deteriorating quality of politics and politicians and the complete obliteration of boundaries between private and public interests. Mark Twain once said in America, the only criminal class is Congress. What he intended as metaphor in America is more literally true of India, given that at least a quarter of parliamentarians have criminal records. For them, meaningful judicial or other administrative reform is unlikely to be a high priority. What is less noticed, and becoming an increasing problem, is the reverse process of private interests becoming public ones. In Pakistan and Egypt, the ruling military class have been creators of "wealth" as one of the key "private sector" actors. India is far from that situation, but increasingly politicians and public officials are brazenly involved in the business of business. For example, it is reported that a substantial fraction of parliamentarians own institutes of higher education not because they have suddenly woken up to the cause of education, but because that is one of the easier routes to acquiring scarce and valuable land. The cheerleaders for India, including Tharoor, assure us, to quote the line from 3 Idiots that "Aal Izz Well". I too want to believe in the "green light and the orgiastic future" (to borrow a phrase from The Great Gatsby) for India, but the concern is that that future will not so much elude India as that its fullest promise will be either unrealised or not realised soon enough. Who is right? The essential vagueness of the question posed for this debate and the fact that it is about the future mean that adjudicating victor and vanquished today is impossible. But ten years from now, if some earnest scholar were scouring The Economist's online archives and chanced upon this debate, there is a metric by which she/he could assess whether Tharoor or I won. If, over the next decade, India were to manage an average economic growth rate of close to 8 per cent, which is well within India's potential (and which is not an unfair benchmark given that China posted 10-10.5 per cent growth for over 30 years), that scholar would have to pronounce that India, a decade earlier, had not lost its way and that this curmudgeon was wrong. Any number below that, and Tharoor will owe me a bottle of the finest Sula Sauvignon "Safeyd" that Deccan soil, Indian sun and Malayali entrepreneurship can conjure up. The writer is a senior fellow at Peterson institute for International Economics and at the Center for Global Development. This article is an elaboration of his concluding statement in an Economist online debate between Shashi Tharoor and him.